According to Dr. Wolfgang G. Schwanitz, the Hochberg Family Writing Fellow at the Middle East Forum, Haj Amin al-Husseini urged Hitler not to allow Jews to flee Europe for Palestine. Israeli Prime Minister Benjamin Netanyahu has taken flack for his comments this week that overstated the influence that Haj Amin al-Husseini had on Adolf Hitler, but a leading historian says that al-Husseini nevertheless played a key role in Hitler's plans outside of Europe. 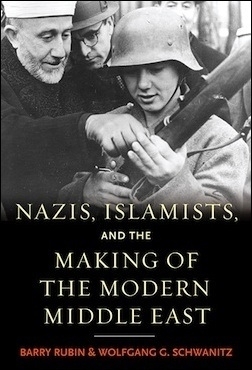 Dr. Wolfgang G. Schwanitz's book, co-authored with the late Barry Rubin, on Hitler's relationship with the Grand Mufti of Jerusalem is being credited as the source of Netanyahu's belief that it was al-Husseini who convinced Hitler to exterminate the Jews rather than deport them from Europe. Schwanitz says that Netanyahu "exaggerated" his claim but insists that the broader argument that there has been a "long-standing incitement of people against Jews" emanating from the Middle East since the 1920s is "certainly correct." Netanyahu said that al-Husseini went to Hitler and told him that expelling the Jews from Europe was not an option, "If you expel [the Jews], they'll all come here." Al-Husseini then suggested that Hitler "burn them" instead, according to Netanyahu. Schwanitz's book is believed to have been the inspiration for Netanyahu's comments. 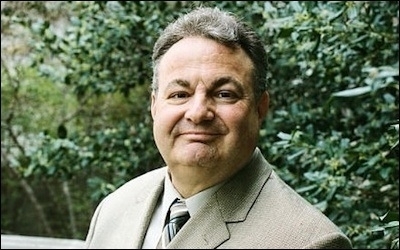 Netanyahu's remarks were accurate concerning al-Husseini's influence on Hitler's immigration policy, according to Schwanitz. Al-Husseini wanted Hitler to end Germany's standing immigration policy—kept in place by Hitler when he took power in 1933—which allowed for roughly 10,000 Jews to leave Germany each year and travel to British Mandate Palestine. "It was a most disturbing factor for al-Husseini that Berlin would facilitate Jewish travel to Palestine," said Schwanitz. "He wanted to fight this immigration by all means. This was his goal: Whatever happens with Jews under Hitler's reign in Europe, they should not come to the Middle East." Al-Husseini got his way. Early in 1941, Hitler agreed to a pact advanced by al-Husseini that there would be no more Jewish immigration to Arab countries allowed. This did not mean that Hitler's plan for the Jews prior to meeting with al-Husseini involved only deportation, as Netanyahu suggested. "Hitler made known his intent to kill Jews since 1920," said Schwanitz. "In Mein Kampf, you find all the racist reasoning and all the means on how to eradicate the Jews." According to Schwanitz, Hitler "assured Al-Husseini ... that he would urge all nations to solve their Jewish problem." Al-Husseini was aware of Hitler's view, aided by the fact that Arabic was the first foreign language Mein Kampf was translated into. Al-Husseini would end up knowing more about Hitler's plans than anybody else outside of Europe. Schwanitz says that al-Husseini was the only foreign guest Hitler ever received who was told the details of Hitler's plan for the Jews. "Hitler always talked about 'world Jewry' and that the Jews were an international problem that needed to be solved," said Schwanitz. "He assured Al-Husseini at that meeting that he would urge all nations to solve their Jewish problem." "There is no other document available where Hitler told a foreign guest, in utmost clarity, what he intends to do—to eradicate the Jews in three steps," he said. Hitler's plan was to first rid Europe of Jews, then the Middle East, and then the rest of the world—and he had a role for al-Husseini in this plan. When the two met, Hitler told him that once the plan reached its Middle East stage, al-Husseini was his man to lead that effort. "There was an oral agreement between al-Husseini and Hitler—we have ample documentation about this talk," said Schwanitz. "Hitler told the Mufti that he would be the Arab leader to execute his plan in the Middle East, and the Mufti agreed." "Hitler told the Mufti that he would be the Arab leader to execute his plan in the Middle East, and the Mufti agreed." Schwanitz says that just before Hitler met with al-Husseini in Berlin, he told his Italian allies that the war in Russia was already won, thus opening the door for an invasion of the Middle East through the Caucasus. "Hitler thought that he would be able to conquer the Middle East either through Egypt or through the Caucasus," said Schwanitz. "As he met with al-Husseini, he thought that the war against Russia was basically won and it was time to turn towards the Middle East." There were specific plans in place for al-Husseini and his allies to greet the invading German armies to provide support once they reached the southern exit of the Caucasus. The invading army would then "liberate" the Middle East from French and British control and leave it under the leadership of al-Husseini. 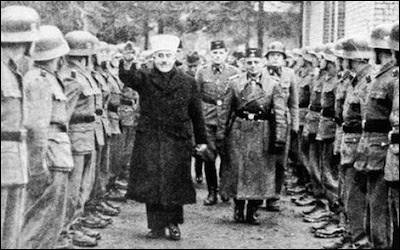 Al-Husseini had already been helpful by recruiting and training Muslims to join the Nazi SS. Following the war, Yugoslavia declared him a war criminal due to the atrocities committed by the Muslim units he put together. Al-Husseini was instrumental in the formation of the Nazi Waffen-SS division in the Balkans, made up mostly of Bosnian Muslims. Schwanitz explains that al-Husseini was eventually removed from the list by Yugoslavia—not because he was found to be innocent of war crimes, but because of fears of backlash from the Muslim world. He was allowed to travel back to Egypt, where he was able to reestablish himself as a leader of Palestinian Arabs in the fight against establishing a Jewish state. Schwanitz acknowledges that even if al-Husseini had not existed, "the Nazis would have done what they did anyway" and "perhaps would have relied on another person like the Mufti"—but they didn't need to. Al-Husseini began to contact Hitler just as he came to power in 1933 and was a reliable partner in his "uncompromising war against the Jews." Schwanitz faulted Netanyahu for misspeaking in his "attempt to be anecdotal," but said that the broader argument he was attempting to make during his remarks was correct. "The general argument Netanyahu made was certainly correct—If you want to stop the current fighting, the incitement has to stop," said Schwanitz. "Since the 1920s, there is a long-standing incitement of people against Jews, for various reasons. This is easily proven."